More background info: In 1975 Pol Pot's Khmer Rouge entered Phnom Penh and emptied the city (like all cities across Cambodia) of its inhabitants, turning them into an enforced purely agrarian "classless" utopia (which in reality meant starving and working millions to death). 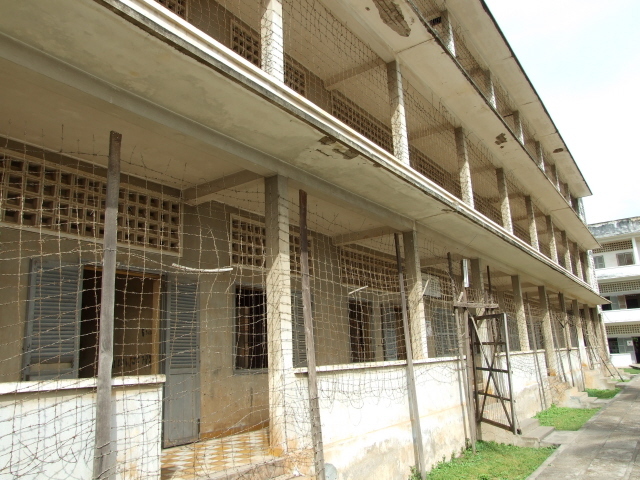 In Phnom Penh, now virtually a ghost town, they took over the building complex at 103 Street, formerly a school, and turned it into a prison. Now code-named S-21' (the <S> standing for "security prison") it became their principal interrogation and torture centre. 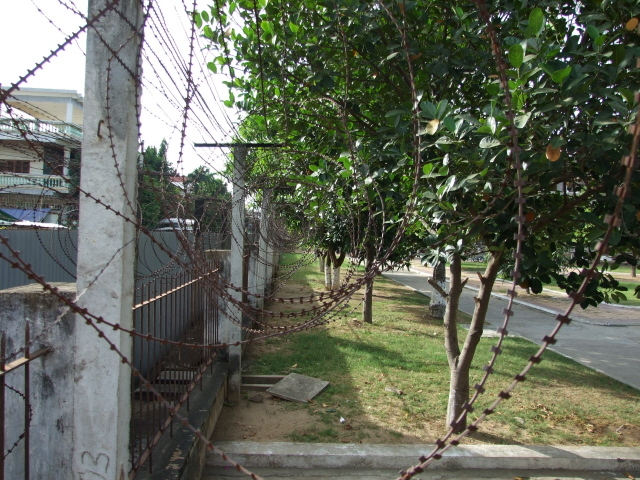 Between 14,000 and 20,000 victims had passed through here by January 1979 (when it was liberated by the Vietnamese) – almost all of these prisoners ended up in the killing fields of Choeung Ek just outside the city. Initially the victims were the typical suspects – previous government officials, intellectuals and all other supposed "threats to the revolution". Gradually, after a series of purges Khmer Rouge comrades themselves became victims too – fallen from grace or subjected to wild (often completely arbitrary) accusations of being "traitors". Such was the paranoia that ran through the system, whose principal motto was "better kill 10 innocent people than let one enemy go free". All prisoners were subjected to the most brutal interrogation/torture methods. Of course anyone confessed to anything or betrayed anybody they were asked to name (irrespective of any real accusations – which is why torture is such an inadequate way of finding out the truth). But none of that was ultimately the point – they were all destined to die in any case. Only about seven (some sources say six, some more than seven) survived this hell – and that was because they were "useful", namely as artists producing paintings and busts of Pol Pot and other leading figures. One of these survivors, Vann Nath, later wrote a book about his experiences, entitled "A Cambodian Prison Portrait" – which is probably the best and most intimate account of what happened here that is available in book form (by the way, you'd expect it to be bitter and disillusioned, but it is anything but – all through the pages shines an astonishing and touching gentleness of character, with hardly a thought of revenge, regret at best, esp. at the fact that Pol Pot died before he could be tried – cf. Anlong Veng). The book is available at kiosks by the entrance to the site and is highly recommended. Vann Nath also contributed to the museum paintings of prison life and torture scenes, still on display. The infamous prison chief "Comrade Duch" (real name Kiang Kek Iev), captured in 1999, is one of the few higher ranking former Khmer Rouge members who finally came to be put before a UN-backed tribunal, in early in 2009. He was finally sentenced to life imprisonment in February 2012. 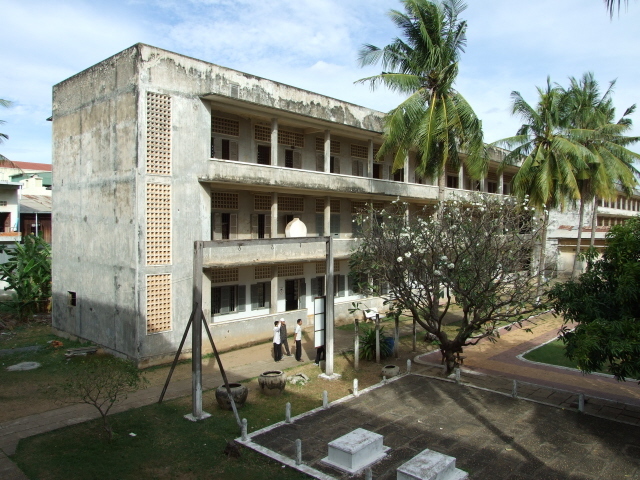 What there is to see: You enter the complex through a gate marked "Tuolsleng genocide museum" – with barbed wire overhead and along the walls. 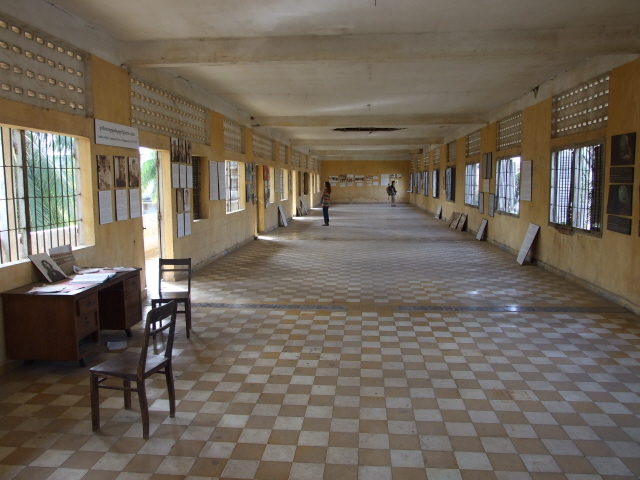 To the left of the reception/ticket booth is an open courtyard area in which the first stop along the circuit is a series of graves made of white concrete … these are the graves of the last victims – found tortured to death when the prison was finally liberated by the invading Vietnamese. Behind the graves you can already see the prison's gallows. But first you carry on left and enter the first of the three former school buildings. 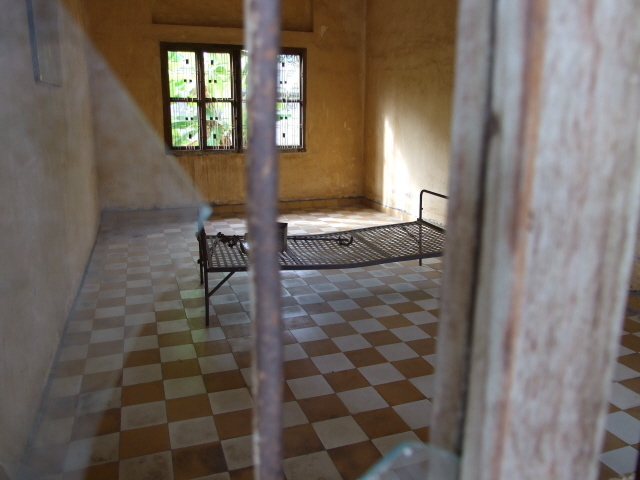 Here are the cells of those last victims – surprisingly spacious and containing just one single iron bed-frame (just the metal grill, no mattress or anything). 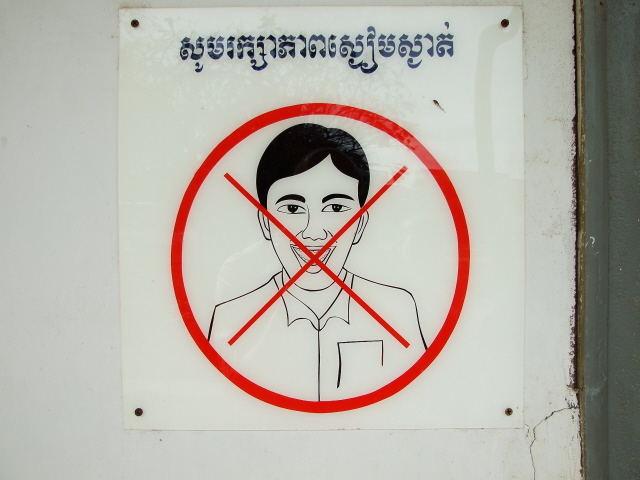 This is the famous image of Tuol Sleng, the one most regularly given as an illustration. On the walls large black-and-white photographs show what the Vietnamese liberators found: the already decaying mutilated corpses of those last victims, strapped to their "beds", large puddles of blood underneath on the tiled floor. Here, it's beginning to get really gruesome. Some of the victims' photos are truly shocking – e.g. that of a boy who can't have been older than seven or eight or so, a weary, part hollow, part terrified expression on his face. Or that of a mother with a small baby in her arms – while being photographed for the prison's records just before her baby was taken from her (to be killed). There's also a photo of one of the few foreigners who passed through S-21. The records go further: even the corpses of torture victims were photographed – and here the exhibition gets graphically gruesome again. Similarly shocking are the pictures of the killing fields – with masses of skulls and bones, dumped in watery hollows and later dug up and sorted. A particularly famous exhibit, by the way, the "skull map" is no longer here, though. 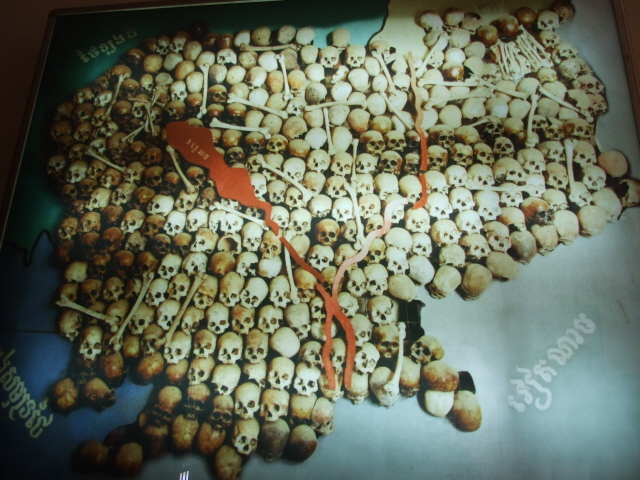 It consisted of skulls arranged to form the shape of a map of Cambodia with the outlines of the Tonle Sap lake/river and the Mekong laid over it in bloody red. This was dismantled in 2002, but some of the skulls are still on display together with a large photograph of the skull map – so at least you still get a decent impression of it (not at this point of the exhibition, though, but towards the end of the present circuit). Another exhibition is "forensic" – and it includes photos of skulls that show the unmistakable signs of having been smashed in. Back to fully gruesome territory. More photos of killing fields, empty cities, the group of survivors, and of the (in)famous skull map as well as charts outlining the expulsion of the cities' populations conclude the circuit. Explanatory texts are in Khmer, French and English on the general charts along the main circuit, and in Khmer and English only in the "reflections" exhibition (and a couple of exhibits are in French only). You can hire guides (at the site or independently – like I did) or roam freely – guides can help in providing context, but other parts are best explored on your own (esp. the "reflections" exhibitions). 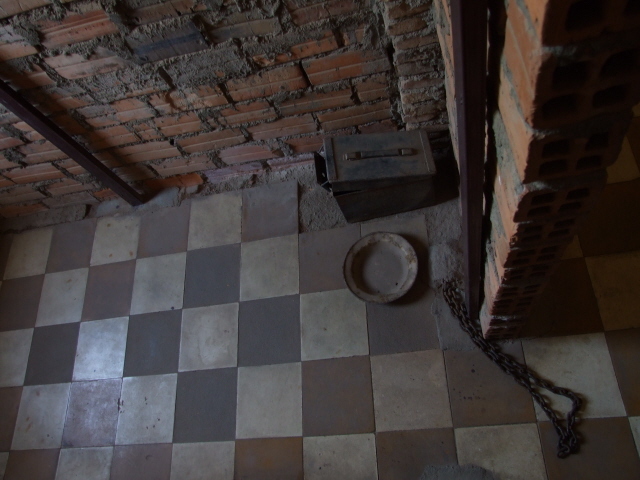 I had a guide for the entire duration of my stay in Phnom Penh, and at Tuol Sleng he provided a perfect balance of giving extra information where it was needed, and leaving his clients the peace and quiet for independent exploration elsewhere. The visitor's experience of the site will probably vary from guide to guide. 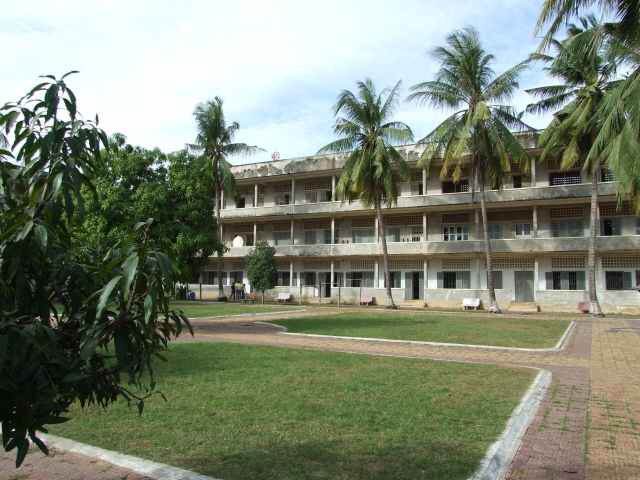 But even without any guide you'll still come out of Tuol Sleng pretty shattered – make no mistake: this is a very hard place to visit. But an absolute must for a dark tourist in Cambodia/South-East Asia. Attached is a shop selling a rather wildly mixed bag of goods, including DVDs, many of which are totally unrelated to the site. Outside are further stalls. One book to look out for is Vann Nath's "A Cambodian Prison Portrait". Location: a bit south-west of the centre of Cambodia's capital city Phnom Penh on 103 Street, between the corners of 320 and 350 Street. Access and costs: easy and not expensive. Details: if you're staying in the central/more touristy parts of Phnom Penh (which is likely), then Tuol Sleng is a little out of walking distance, so a taxi/tuc tuc/moto can see to the transportation – it doesn't cost much within the city. Many people come to Tuol Sleng on pre-organized tours anyway – and if that's a private, tailor-made tour then that's not such a bad idea: some of the guides who look after you on such tours can greatly enhance the experience, even if you obviously have to splash out a bit for it … but if doing it that way, the admission fee to the museum will often be included, at least. Otherwise you're charged the 3 USD they currently take – which isn't a lot for what you get – and is certainly well-needed money (in fact you couldn't complain if they charged a lot more – and then used the money for clearly needed repairs/maintenance). Theses days you can also hire an audio-guide (for another 3 USD), and I've heard very good things about it (relevant, comprehensive, well narrated), but since I had a live guide instead, when I was there before the audio-guide alternative appeared, I can't vouch for its quality myself. If I ever went to re-visit the site, though, I'd definitely give the audio-guide a try! Opening hours: daily from 7:30 a.m. to 5:30 p.m.
Time required: You can easily spend at least two hours here – though most people don't, either because it's too much to handle or because they are on organized tours that don't give them that much time. But it is worth the full time investment! Don't let yourself be rushed here. 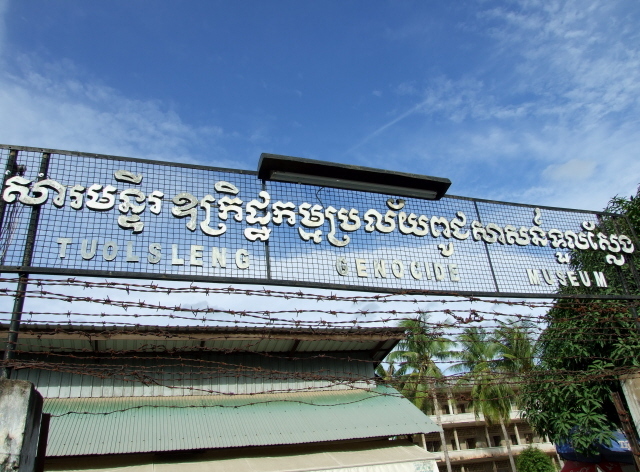 Combinations with other dark destinations: in general see Cambodia – the most immediately obvious other site to combine a visit of Tuol Sleng with is of course Choeung Ek, the killing fields just south of Phnom Penh, the place where nearly all of the victims of Tuol Sleng were eventually executed. 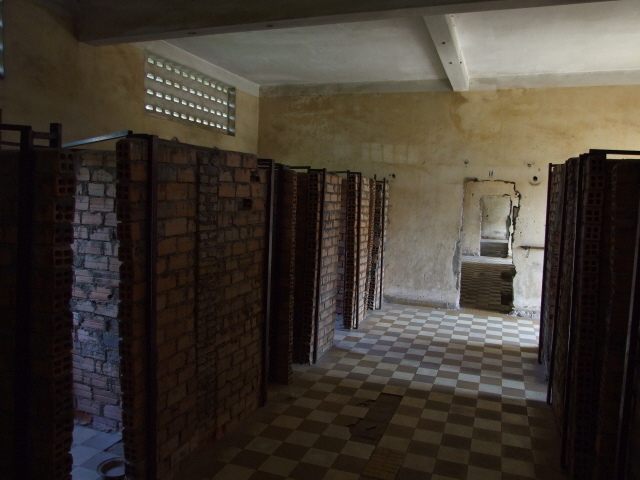 It's a very gruesome place in its own right, though not as informational as the Tuol Sleng genocide museum. Right opposite Tuol Sleng there is said to be (I've not seen it myself) a Khmer Rouge themed "history" café (complete with black-clad waiters with red scarves serving deliberately meagre "meals", which are nevertheless overpriced) – it's predictably controversial but may be worth a look if you can handle it. On the Riverfront (a touristy strip near the banks of the Tonle Sap river to the east of the city centre), the Mekong River restaurant/bar/café could be of interest (the name is geographically not accurate as the actual Mekong river confluence with the Tonle Sap river is still a little further downstream): it has an upstairs room where videos about Cambodia's dark history are shown on a large(ish) screen – not quite cinema-size, but close enough. One of the two regular films on show is about landmines (and Princess Diana's work for raising public awareness of the problem – see also Landmine Museum in Siem Reap), the other film is (supposed to be) about the Pol Pot years and the genocide – but it turned out to be amore about the role and views of (the previous) King Sihanouk, but it was still worth it. Screenings alternate between English and French language (several a day, fewer in French). On the waterfront roughly opposite the confluence of the Mekong and Tonle Sap rivers is the famous FCC (Foreign Correspondents Club) of Phnom Penh – a place steeped in history, though these days it's only a commercial enterprise: a rooftop bar/restaurant (and a small hotel with rooms underneath the bar action …), but it's still one of the preferred expat hang-outs. The views across the river(s) and onto the streets below are great. The walls inside are used for regular art and photo exhibitions – and this is the reason why I mention it here: at the time of my visit (in December 2008), photos by acclaimed photographer Al Rockoff were on display, and for sale (he has one of his homes in Phnom Penh – so if you're lucky you might even encounter the man himself) – esp. haunting were pictures he took while with Sidney Schanberg and Dith Pran at the time the Khmer Rouge took over (see background info). I particularly remember an image of a frightfully young child soldier with a gun as big as him and an "evil" glint in his eye. Most of Rokoff's photos will no longer be on display by the time you read this, but the FCC usually keeps at least one item from every exhibition – in fact, their online gallery suggests that in this case they even kept a small handful … it's worth a look in any case. Combinations with non-dark destinations: Phnom Penh, Cambodia's capital city, is worth a visit in its own right – it still has a slightly chaotic and (traffic-wise) anarchic feel to it, and that takes a little getting used to esp. as a pedestrian, but maybe it's exactly that that makes it so exhilaratingly different to other more westernized cities such as Saigon/Ho Chi Minh City just a little further south in Vietnam. The premier mainstream tourist attraction Phnom Penh has to offer is probably the Royal Palace (with its Silver Pagoda – which isn't actually silver, only the floor inside is) – it can almost, though not quite, rival its Bangkok equivalent. Other important sights include: the Central Market, the National Museum, Wat Phnom, and the Independence Monument. Further afield, a cruise up the Mekong river is popular (or downriver to Vietnam), as is the magical Tonle Sap lake and its "floating villages". Cambodia's coastline is becoming a "secret" destination for lovers of non-tourist-developed beaches. And then of course there's the one huge tourist attraction, the one that put Cambodia on world tourism's map in the first place and needs neither introduction nor comment: Angkor Wat & Co. (cf. 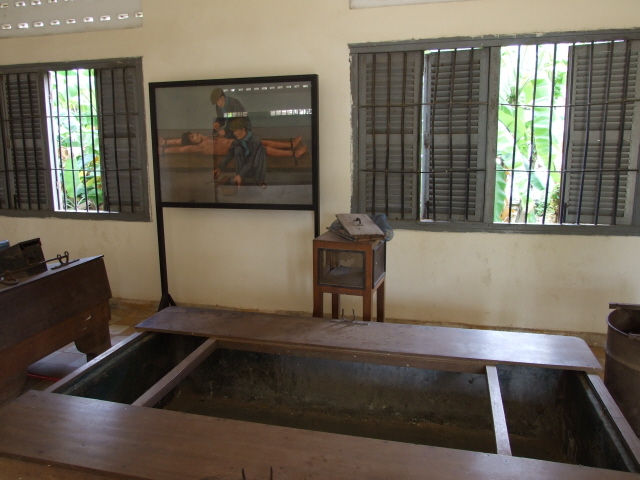 also Cambodian Landmine Museum near Siem Reap). The infamous prison chief "Comrade Duch", captured in 1999, is one of the few higher ranking former Khmer Rouge members who finally came to be put before a UN-backed tribunal in 2009. Location: a bit south-west of the centre of Phnom Penh on 103 Street, between the corners of 320 and 350 Street. Access and costs: easy and not expensive – details: if you're staying in the central/more touristy parts of Phnom Penh (which is likely), then Tuol Sleng is a little out of walking distance, so a taxi/tuc tuc/moto can see to the transportation – it doesn't cost much within the city. Combinations with other non-dark destinations: Phnom Penh, Cambodia's capital city, is worth a visit in its own right – it still has a slightly chaotic and (traffic-wise) anarchic feel to it, and that takes a little getting used to esp. as a pedestrian, but maybe it's exactly that that makes it so exhilaratingly different to other more westernized cities such as Saigon/Ho Chi Minh City just a little further south in Vietnam. And then of course there's the one huge tourist attraction, the one that put Cambodia on world tourism's map in the first place and needs neither introduction nor comment: Angkor Wat & Co. (cf. also Landmine Museum near Siem Reap).